Georgia State University’s Confucius Institute (GSUCI) won Confucius Institute of the Year at the 13th annual global conference hosted by the Office of Chinese Language Council International, or Hanban, the organization’s headquarters led by the Chinese Ministry of Education. Georgia State was the only Confucius Institute in the state of Georgia, and one of only three Confucius Institutes in the United States, to receive the esteemed honor. Emory, Kennesaw State, and Augusta University are among some of the Georgia institutions that house a Confucius Institute. Dr. Wolfgang Schlör, the associate provost for International Initiatives at Georgia State, accepted the award on behalf of the university as the executive director of the GSUCI. President Mark Becker, head of the GSUCI Executive Board, also gave remarks during a partner banquet before the opening of the global conference in Chengdu, China. 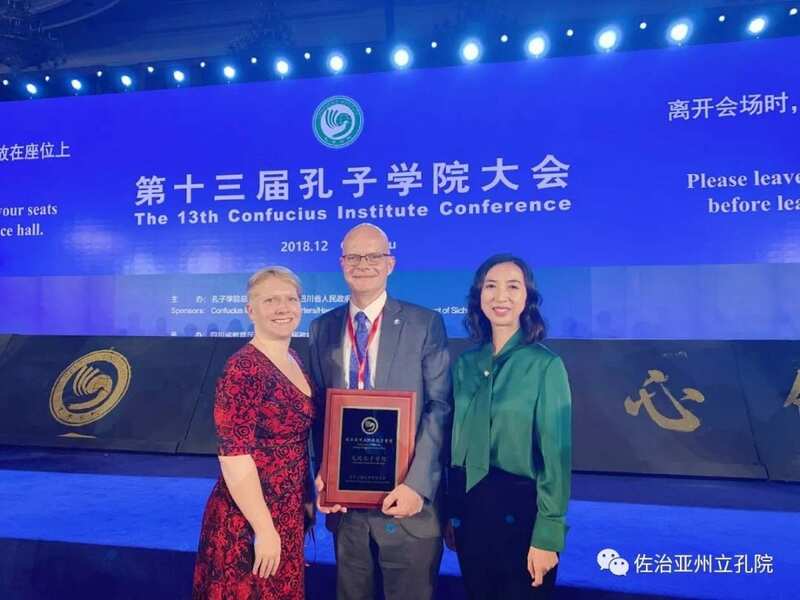 “The award is a well-deserved recognition for the faculty, staff and interns of the Georgia State University Confucius Institute who have worked so hard to bring Chinese language and culture to more of our students and to the Atlanta community,” Dr. Schlör said. Among the GSUCI accomplishments in 2018 was the launch of multicast Chinese 1001 courses on Perimeter College campuses. The interactive course expanded access by Georgia State students to live Mandarin lectures and coursework taught by GSUCI instructors (visiting faculty from their partnership with the Beijing Language and Culture University) and increased student enrollment in Chinese credit courses. GSUCI’s efforts to collaborate with Georgia State colleges and schools on university-wide cultural events has also helped raise student participation by 103% on all campuses. Areas of focus include U.S.-China history, Chinese philosophy, and the arts, with events such as a lecture on the Flying Tigers in China during WWII, Chinese woodcarving and printmaking workshops, and the annual Spring in Atlanta Chinese New Year Gala performance. Exposure to GSUCI’s cultural events and language programs has encouraged Georgia State students to participate in study abroad programs in China for Mandarin language immersion and to further their understanding of the culture and history, such as the Maymester program in Beijing, in collaboration with Beijing Language and Culture University. The center also organized faculty and staff travel programs for working professionals seeking insight into China’s educational system. Hanban also noted the unit’s collaboration with high-level international groups, such as the Carter Center, World Trade Center Atlanta, and the World Affairs Council of Atlanta, to host business-oriented programming for the Atlanta community. GSUCI’s successful events of the past year include the annual Doing Business with China forum, the One Belt and Road Initiative panel, the China Breakfast Briefing. Since its establishment in 2010, the GSUCI, a business-focused Confucius Institute, has provided comprehensive services for promoting Chinese language and culture, fostering intercultural exchange between China and the U.S., and delivering unique resources for business communities in Georgia. This is the second time Georgia State has received the Confucius Institute of the Year Award from Hanban. In 2012, two years after opening on the Atlanta campus, the GSUCI was named a recipient of the award, followed by President Becker receiving the prestigious Confucius Institute Individual Performance Excellence Award at the 10th annual global conference in 2015. For more photos of the Georgia State delegation at the Confucius Institute’s 13th annual global conference in Chengdu, China, please click here. The Office of International Initiatives at Georgia State University is responsible for the strategic integration and coordination of the University’s international initiatives, partnerships, grants, program development and management, events and activities, study abroad programs, and the Confucius Institute.